Did you know you can create a spectacular background with lots of die cut labels? We love this unique spin on using labels and it’s a great way to feature how this set can be used in so many ways. 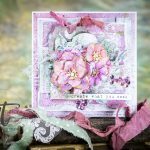 Designer Julia Stainton created this beautiful layout featuring scraps of paper die cut using the new Sapphire Simply Tags die templates. This scrapbook page measures 12 x 12â. 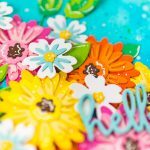 Create 12 x 12″ scrapbook page from white cardstock. Cut 16 labels from scraps of patterned paper using the Simply Tags die template set and the Sapphire Machine. Adhere labels with adhesive in a block format to create the background. Adhere 4 x 6″ photo on the right side of the design. Adhere Text Sticker sentiments over and around labels as journaling accents. Adhere gold glitter stickers along bottom of photo to create page title. Ahdere various embellishments over the die cut labels to accent the design. 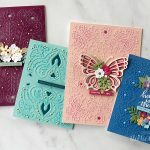 Cutting scraps of patterned paper is a great way to use them up and get more creative mileage from both your paper stash and your Spellbinders Dies!